Norber Erratics, Austwick, North Yorkshire. SD7659 7003. High upon the moors a few miles to the north of Austwick and the A65 Ingleton road are several large Silurian sandstone and slate boulders that were brought here at the last Ice-Age between 12,000-15,000 years ago by glacial movement. These odd-shaped boulders stand upon little limestone pedestals or stilts, some of which are up to 60cms high. 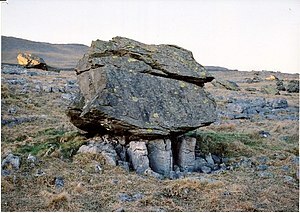 When the glaciers moved (retreated) south from the Lake District they picked up large stones and boulders on the floor of Crummackdale further to the north of Norber and, after the ice melted away these erratics were deposited or shifted upwards – usually up to the higher ground to the west of the Pennines. These large boulders are said to be from the Ordovician geological period some 400million years ago, while the white limestone beneath them is much younger – only 100 million years ago. Over many thousands of years the boulders have protected the little pedestal formations beneath them from the weather, whereas the other surrounding limestone has been worn away – and that is why the boulders have been left looking like they are today – up in the air. The name erratic means “scattered about”. Categories: Austwick, Glacial Erratics, Norber Erratics | Tags: Norber Erratics near Austwick in North Yorkshire | Permalink.